Korean food is unique, colorful and full of flavor! To say that all Korean’s LOVE Kimchi would be an understatement. Kimchi is more or less a ‘food group’ in Korea and all meals (breakfast, lunch and dinner) will be accompanied by some type of Kimchi side dish. Kimchi is generally made of fermented cabbage and seasoned with different ingredients. Many Korean’s have a second full size fridge that’s dedicated to storing various types of Kimchi. Galbi is definitely a fan favorite among westerners. Fresh beef grilled on an open flame with a plethora of side dishes…what’s not to love! 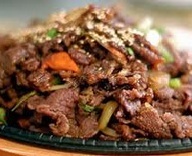 Bulgogi is one of Korea’s most famous mainstream dishes internationally. Seasoned beef in a savory sauce with mixed vegetables is a delicious choice any day of the week. Bibimbap is a healthy, cheap and delicious meal that’s usually served hot with rice, fresh vegetables and a fried egg on top. 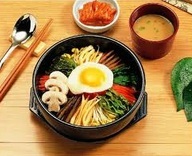 Most restaurants will serve a small dish of kimchi, yellow radish and soup with the meal as well. There are countless fried chicken franchises in Korea that sell numerous flavors and styles. 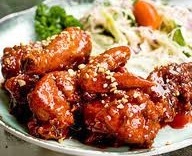 Chicken in Korea generally comes with sweet cubed radishes and most of these restaurants will offer free delivery. Ramen is a favorite and staple food across Korea and much of Asia. 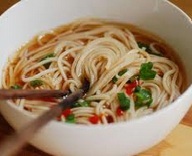 These noodles are usually purchased in packages, or paper containers, and are ready to eat within minute of adding boiling water. Ramen has countless flavors to choose from including; beef, shrimp, vegetable, kimchi, etc. Samgyupsal meals are very similar to Galbi meals; fresh meat cooked on an open grill in the middle of your table with plenty of side dishes. 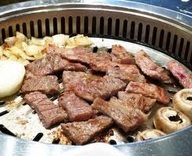 Unlike Galbi which uses beef, samgyupsal meals consist of various pork cuts. Many westerners tend to enjoy the open table grill. 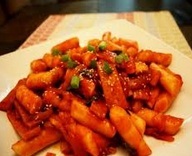 Ddeokbokki is a pretty simple dish (thick rice sticks mixed with spicy sauce) but well-loved throughout the country. Ddeokbokki street vendors can be found everywhere, similar to hotdog stands in the west. 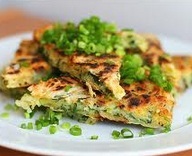 Korean seafood pancakes can be eaten as a treat, appetizer or meal. This fried dish is made with fresh vegetables and an assortment of seafood (shrimp, squid and possibly oysters) and served with a soy based sauce.